Police arrested two people at a heated city council meeting in Alameda over rent control. 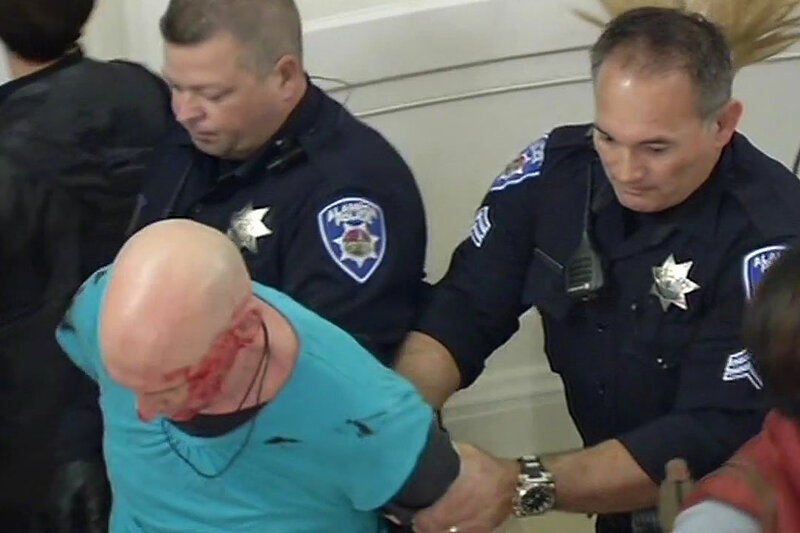 ALAMEDA, Calif. (KGO) -- Police arrested two people at a heated city council meeting in Alameda. Home and apartment rentals are out of control on an island where more than half of the population rents. Almost everyone knows someone who has been affected by rent increases and that's why the meeting got so emotional. As of 11 p.m., the city council was still discussing a moratorium on rent increases. Tempers were already hot, but it got worse after a majority of Alameda landlords arrived early and monopolized the seats. One man tried to rush into the council chambers and appears to drag down assistant City Manager Bob Haun who tried to stop him. Police picked the man out of the crowd and threw him to the floor in front of a protester's camera. The bloodied man was arrested, along with another man who was handcuffed outside of the council chambers. "Twenty-five landlords have spoken, four renters have spoken. We're trying to have a meeting," said Cathryn Hopping, a moratorium supporter. The mayor decided to allow an equal number of tenants voice their concerns. Rene Hutchins pays $1,875 a month for a two-bedroom apartment. "I've gotten a $300 rent increase and then also she's asking me to leave in 60 days, next month, during the holidays," Hutchins said. That's why Alameda tenants are in favor of a temporary moratorium to limit or halt rent increases while the council examines the possibility of rent control. "We're watching friends and family get squeezed out of this town, with evictions, with no cause," Hopping said. But many small landlords say rent increases are needed to offset rising taxes and maintenance costs. "Any restriction on my ability to rent is like anybody here getting a restriction on what they would earn in income," said Mark Landreth, a landlord. Landlords want the city to stick with its rent review advisory committee, which helps mediate and resolve significant rent increases. WARNING: This link below contains video that is graphic and contains strong language.